Bruges, Belgium. I did it. I took the detour to Bruges (broozh, in French and English), or Brügge (brooguh, in German), and Brugge (but I’m not sure of the phonetic spelling, in Dutch), from Amsterdam to Paris. The direct high-speed rail straight to Paris would have not only been faster and less expensive but I would have stayed warmer and drier and I would have been in Paris HOURS sooner. But, I took the detour anyway, in order to spend a few measly hours in a Belgian village. It was a ridiculous notion. It made no sense. What if something had happened to me? No one I love would have known where to find me. It’s not like I had ever been in the area before: it was truly foreign. But, I had to see Bruges. And, it wasn’t easy. I had to switch trains in Brussels and got off at the wrong station. I ended up waiting. And, WAITING for the right train. I was tired and cold and hungry and the sky looked like it was going to open at any moment. I was lugging a suitcase that was too heavy and too big and when I finally got to Bruges, I had trouble finding a baggage locker that was big enough and then had trouble cramming it inside. 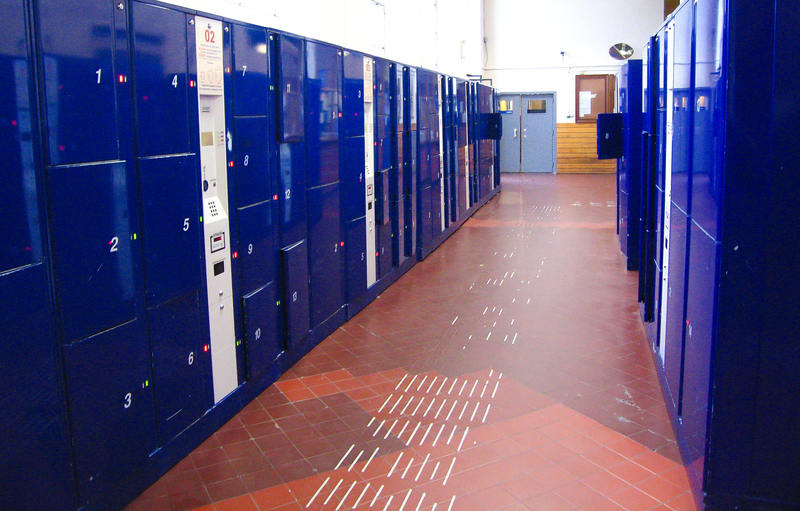 I was worried I didn’t have correct change for the locker. But, Bruges is between Amsterdam and Paris in a crooked sort of way and I’d read so much about it, and even though I had but a few hours, I said to myself, why not go to Bruges? When would this opportunity present itself again? I was travelling by myself. No one was going to be inconvenienced by my need to see this historic town. No one, but me, that is. And, I didn’t care about the inconvenience. I wanted to see Bruges. And, I will. And, I will stay longer next time. And, I’ll eat frites with mayonnaise. I’ll visit the Groeninge Museum and the Church of Our Lady and the Memling Museum and the Begijnhof and maybe even the Bruges Beer Museum! 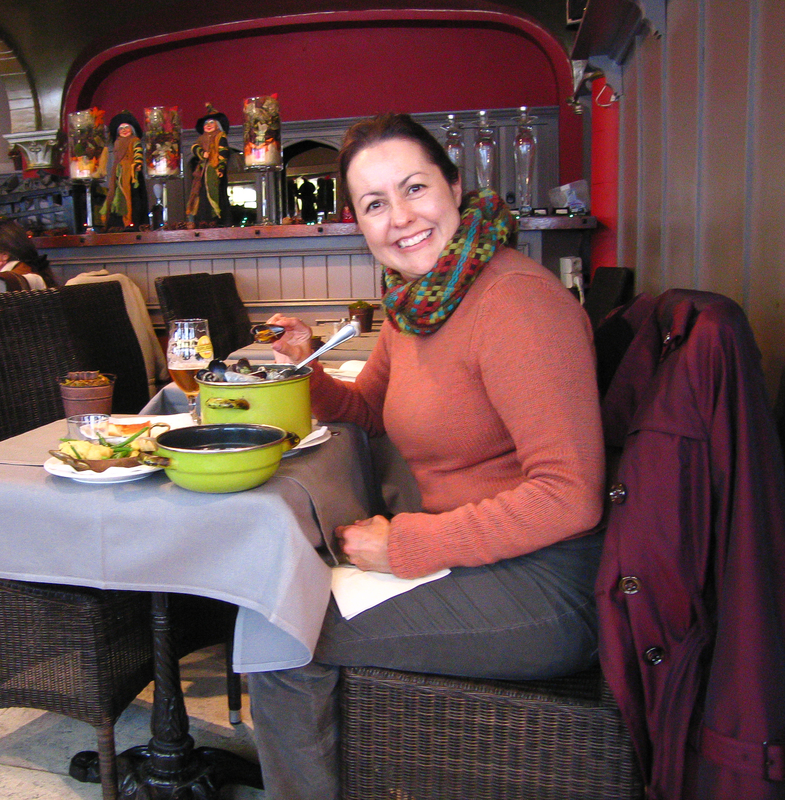 Mussels in Brussels, er, I mean, Bruges! Look at me and my Mussels! and having one of the most special and surreal musical experiences of my life was enough. In those few hours, I was given memories that will last a lifetime. And, none of it would have happened had I not made a quick decision, gotten a bit lost, and endured not a little discomfort (which incidentally included a mad dash in the rain back to the station where I feverishly retrieved my suitcase and very nearly missed my 1837 train to Paris). Inconvenience? What inconvenience? I’m trying to make of this short life exactly what I hope to; to give in to inspiration, and to experience this world as fully as I can. It won’t be the last rash act, the consequences of which may not always be a beautifully preserved Belgian town. But, I’ll take my chances. That decision to detour made no sense whatsoever. But it was the most sensible thing I could have done. This entry was posted in Amsterdam, Bruges, Paris, London - Nov 2010, Bruges and tagged architecture, Belgian beer, Belgian waffle, Belgium, Bruges, Bruges Town Hall, Brugge, Burg Square, De Steeghere, Gothic architecture, high-speed rail, Holy Blood Chapel, Market Square, Markt Square, Old Civil Registry, solo-travel, street musicians, travel. Bookmark the permalink. Thank you so much for the tweet, @PhotoTourBrugge! What an honor! Thank you so much, Susan Reynolds, for tweeting my blog post! Have a very special day! 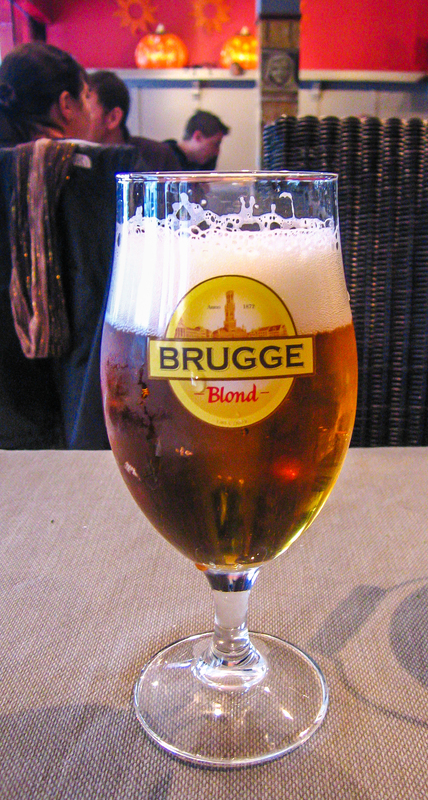 Renate – here is a link to a page on which you can find a good audio representation of the Flemish pronunciation of Brugge. I’ll leave it to you to try to determine how to represent that phonetically to native English-speakers. It took me a LONG time to even come close to pronouncing it correctly. Susan, what do you think, Bruh-hhhuh? I’ll look forward to the link, Susan! Thank you! Very smart that you know that Bruges is Brugge (brooguh) in German… People speak Dutch there. NOT German. Germans call it “Brügge” (bruehu). 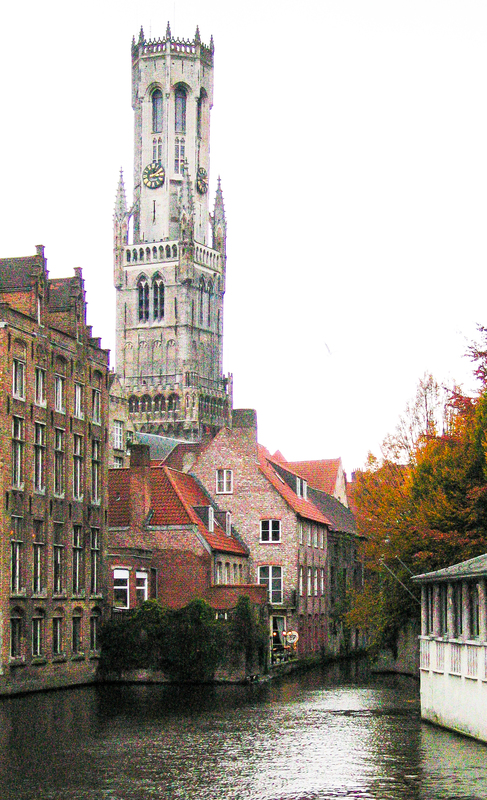 And most of Bruges citizens also speak Fluent English, unlike in Paris, where you cannot get lost, of course. For your next trip to Brugge: all trains through the Midi Train Station in Brussels going to Bruges also stop in the North and Central station. 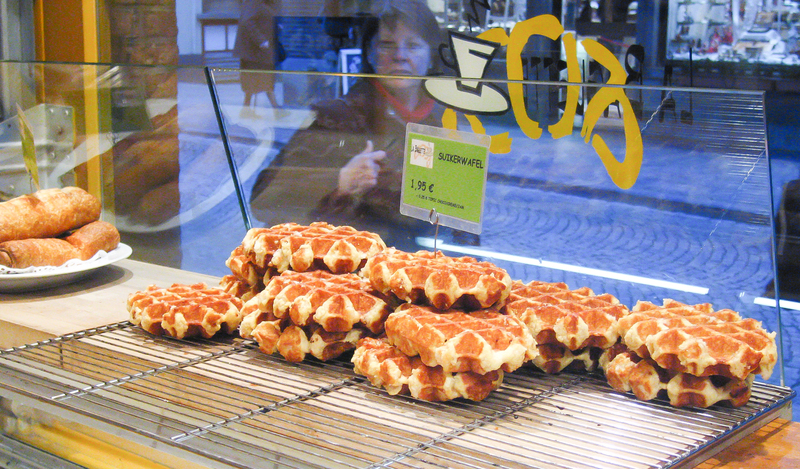 There’s no way you can stop in the wrong station to go to Bruges. Thank you, Frank, for your corrections. I saw the pronunciation for the Dutch as I was writing this and could not figure out how to write it phonetically (!) so I stuck to the German phonetic spelling (which I do think is close, although you might disagree). I did not mean to imply that German is spoken in Bruges, and I appreciate your clarification that Dutch and very good English are spoken there and, I might add, very good French! What a marvelously multi-faceted city is Bruges! On an impromptu journey when all is unfamiliar, and all seems unclear, I was indeed quite lost. But I still enjoyed my detour so very much. I thank you sincerely for taking the time to comment and hope that the message in the post was clear – that even if mistakes are made that produce discomfort, following our hearts in search of our own personal adventure is what is necessary and so very, very important and can bring us unexpected and beautiful rewards. Hi,my name is Valérie and i am from Bruges. Thanks for the lovely pictures you took from our city.I hope the next time you come to Bruges it will be a litlle longer.There are so many places in the city you have to see,so beautyful. Thank you, Valérie, for you kind comments. How lovely to be from Bruges! I do plan to stay much longer next time, but am so grateful for even the small amount of time I had in your beautiful city. I visited Bruges as an Australian tourist, travelling in my birth country with my Belgian friend Muriel and her two kids. Funny I d never been there before, as a Belgian living in Belgium. You are right, it is extraordinarily beautiful, and next time I am back in Belgium, proudly Belgian again ( thanks to the changes in dual nationalities regulaltions ), I will be able to have a romantic rid on the canals with my New Orleans husband ! Thank you for sharign the photos and words, loved them! By the way, the film ‘Bruges’ with Colin Farrell really takes you there! Thank you so much, Brigitte, for sharing your remembrances and kind thoughts. Congratulations on dual nationality which allows your identity to expand and return you to you and your country of birth! I love thinking of you and your husband on the canals. I’ve seen the movie, ‘Bruges’ and thought it a bit violent, but perhaps I should watch it again and focus more on the surroundings! Stories like this are the best. It’s a time where you don’t think and just act, and clearly from these pictures the reward was priceless. Sometimes the best adventures are the ones that find us! 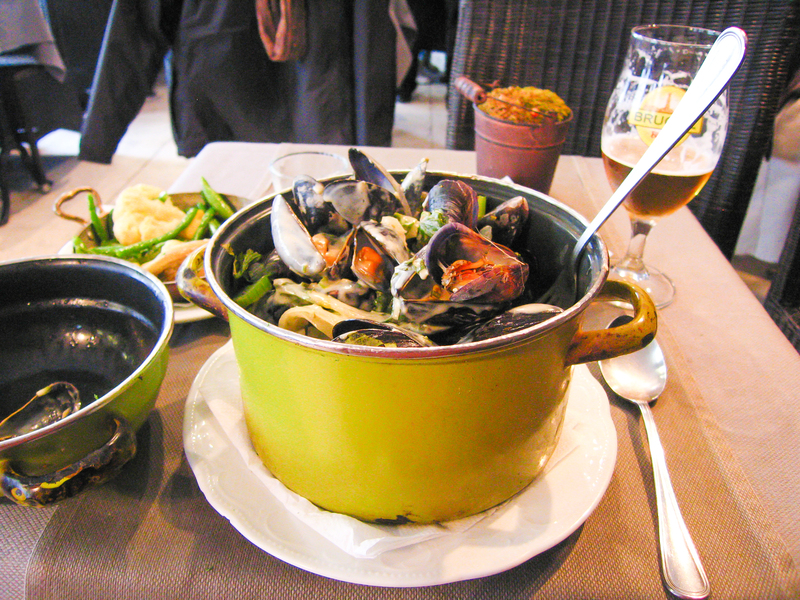 Those mussels look delicious and Bruges, absolutely marvelous!